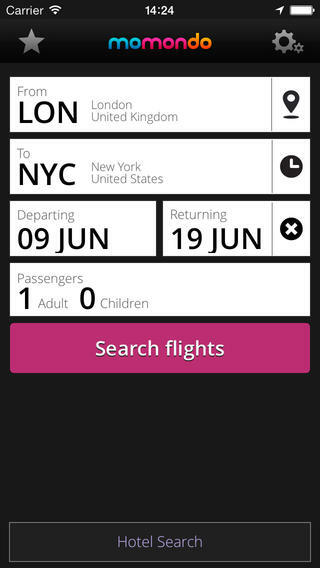 Momondo is an iPhone app designed to make it easy for you to find cheap flights. 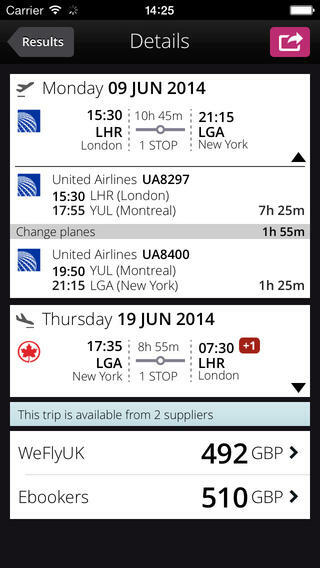 Developed by Momondo, the app offers a mobile version of the same powerful flight-finding search engine as the website. The app is built to be easy to use and it’s simple to get started. Just enter in your starting city, your destination and departure and return dates. The loading screen features an image of your destination city and then you’re quickly delivered the flight results. There are tabs across the top of the screen that let you move between the cheapest fare, quickest flight time as well as options for ‘early out’ and ‘late in’. The results provide all of the information you need at-a-glance: carrier logo, fare, as well as departure and arrival times for both the onward and return flights. And for anyone who has done a lot of flying – the all important total transit time. If you click on a result you’re able to drill down into the details to find the exact flight number, stop-overs and duration of each flight leg. The Momondo app then offers you the choice of several suppliers from which you can purchase the fare. If you don’t like the look of the first few fares, there is a filter you can apply to give you more relevant search results. 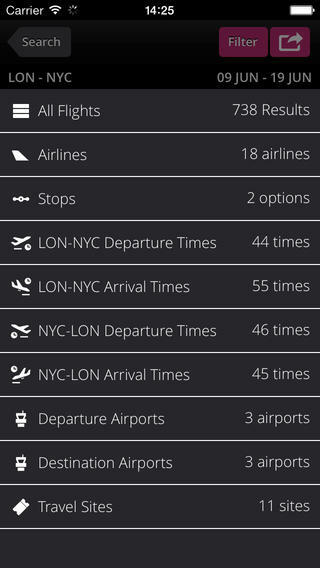 You can filter for the number of stops, departure timing, airlines as well as the airport that you fly in to (when the city has multiple). General settings are available to localise your experience – you can easily change currency, language and distance (km vs. miles). 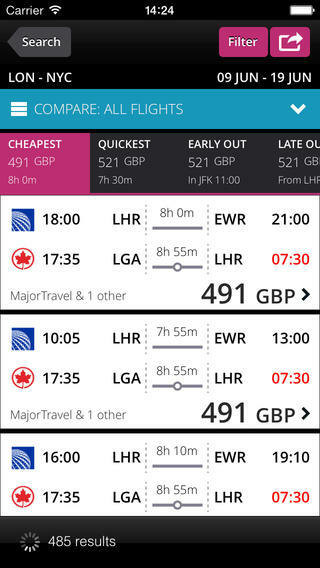 At this stage, the Momondo iPhone app only facilitates finding cheap flights. There is a link within the app that takes you to the Hotel booking page on the Momondo website, where you can also find good deals on holiday accommodation and car rental. Overall, an excellent travel app for iPhone. Delivers comprehensive and easy-to-read results. Momondo requires iOS 6.1 or later. Compatible with iPhone, iPad, and iPod touch. This app is optimized for iPhone 5. Follow Tapscape for reviews of all the best iPhone travel apps.